Barbra's appearance on The Judy Garland Show was one of those moments in entertainment that just seemed destined to happen. 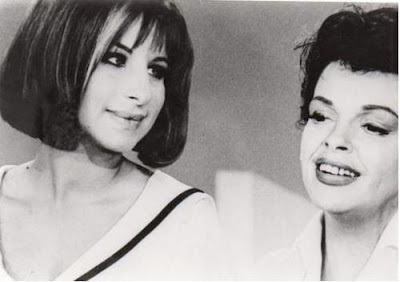 Barbra and Judy's paths crossed in a moment of early television that many consider to be one of Barbra's best appearances (she was even nominated for an Emmy). That particular episode is one of the most significant television episodes of all time. With Judy clutching tightly on to Barbra's hand, the two performed a duet that used both of their signature songs as a foundation. Their "Happy Days / Get Happy" number will always be remembered for the warmth and affection both Judy and Barbra displayed towards one another.